IOGEAR's 8-port KVM and LCD KVM console bundle offers a space-saving, streamlined approach to IT environments by integrating a keyboard, 15" LCD monitor, and touchpad in one unit, the 8-port KVM is bundled as the additional tool to manage the servers. The LCD display is built into the cover; the keyboard and touchpad are built into the base. Setup is fast and easy. There is no software to configure, no installation routines, and no incompatibility problems. Slide the console module section out; flip the cover up; and you are ready to go to work. When finished, flip the cover down and slide the console module away back into the rack. For further convenience and flexibility, the LCD drawer also supports an external keyboard, monitor, and mouse console that allows a second user to access the computers remotely or locally, additional remote control is required. The bundled IOGEAR KVM GCS138 allows you to manage all eight computers with a single keyboard, monitor and mouse. Just think of the time, space and money you'll save. The capacity can be increased to control up to 512 computers by cascading with additional GCS138s. Many other features are included in this bundle. Built-in AutoScan mode lets you conveniently monitor every attached computer for a specified amount of time, while the On Screen Display technology allows you to assign a unique name to each computer and access it via a slick, menu-driven interface. 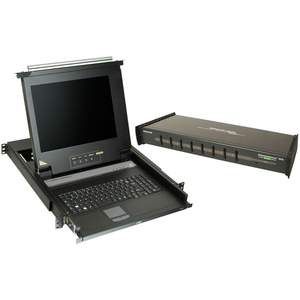 Product Description: IOGEAR LCD Drawer and 8-Port KVM Bundle GCL138 KVM console TFT 15"